Why Do Flight Attendants Pester Passengers In Having Their Seats In The Upright Position? You probably wonder whenever you fly as to why flight attendants pester passengers to keep the seats in the upright position. Apart from it being one of the aviation’s rules, there is actually a basic science behind it. The two main reasons why passengers are requested to keep the seats up: First, to keep injuries to a minimum during crash. Second, a quick exit is possible since you don’t have the seat in front of you blocking the way out. “When the seat is up, it is locked. When the seat is back, it’s not locked. In the event of an emergency, an unlocked seat has more force during the impact, and the thrusting forward of that seat can cause passenger injury,” said Brian Manning, a flight attendant for Mesa Airlines. “Since most accidents occur during takeoff and landing, it is for the safety of everyone onboard the aircraft to have all the seats in their upright and locked position, added Mesa. True. People sitting behind the seat that is reclined or unlocked will not be able to brace properly as well. Even when the airline is being at rest you should always put your seats in their upright position. Why? Because anything can happen. 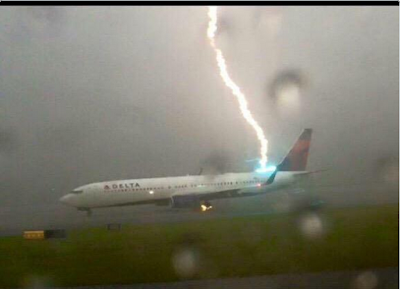 Take for instance this Delta Airlines. The Greek god Zeus commanded the lightning to strike it. Fortunately, everyone onboard was fine. But regardless, that’s a reminder worthy to keep. Note: The video was taken by Jack Perkins while at Hartsfield-Jackson Atlanta International Airport to update his wife about the weather. But what he captured was breathtaking!